Following the government’s new Careers Strategy in December 2017, schools are expected to follow the Gatsby Career Benchmarks. The eight benchmarks outline the key dimensions of good careers provision in schools and range from opportunities to encounter employers and workplaces, to personal careers advice for every pupil. They have been introduced to ensure that all pupils receive a high-quality and well-rounded careers advice service. However, many schools will struggle to hit the target of meeting all eight benchmarks by the end of 2020 with other competing pressures and demands. The Franklin Scholars programme has a strong grounding in key employability skills thanks to our ABCD Shield, which is made up of 24 skills that we use to train our Franklin Scholars, design our resources and evaluate our participants’ social and emotional progress. All of the skills are valuable, but many of them are also are frequently cited by employers as desirable, including leadership, teamwork, resilience and problem-solving skills (see our most recent impact report for the full range of the skills). 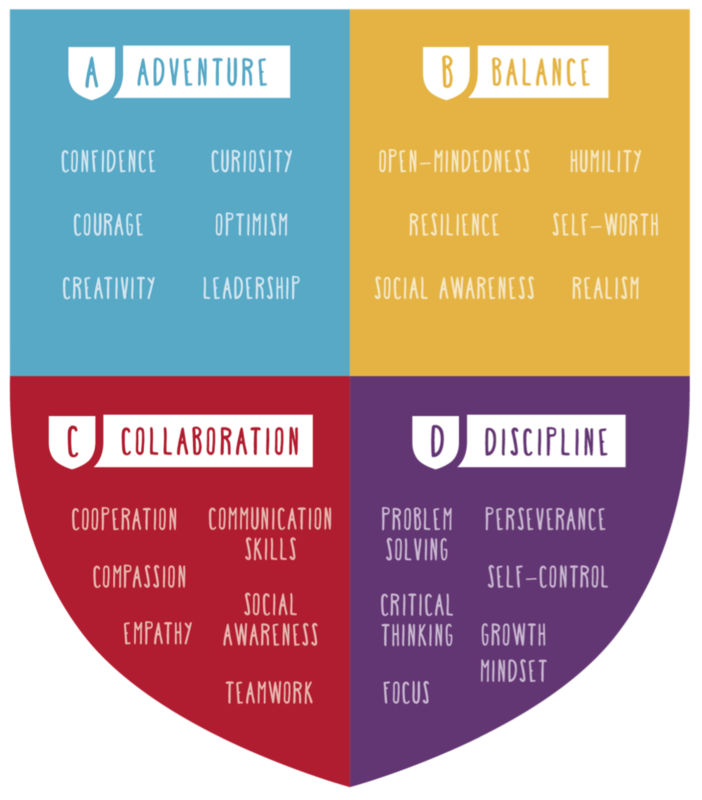 The Franklin Scholars ABCD Shield, which brings together 24 social and emotional skills and habits important for future success. Though the core of our programme takes place within schools, over the course of our year-long programme, participants often have the opportunity to hear from a number of professionals. For example, at our annual Festival of Ideas events pupils pitch an idea to a Dragon’s Den panel made up of individuals from a range of career backgrounds. In the past, these have included the Head of Community at Stoke City Football Club, the Dean of the University of Derby, and representatives from the third sector. Pupils also meet a range of members of the Franklin Scholars staff members over the year and have the opportunity to attend regional and national events, all of which exposes them to various speakers and employers. Although our programme takes place in the school setting, we give Franklin Scholars the valuable experience of participating in a recruitment process. Franklin Scholars are selected through an online application and following a short face-to-face interview. For most young people, this will be their first interview experience, so we support them by providing hints, tips and plenty of encouragement. All candidates, whether they are successful or not, receive personalised written feedback on their application to help them improve in the future. In addition, through our programme, Franklin Scholars are responsible for not only managing a one-to-one mentoring relationship for an entire school year but also for planning group activities for up to 20 younger mentees. Through the programme, Franklin Scholars receive training on long-term planning, improving their self-efficacy, problem-solving, and how they can become agents of change in their communities through social action; these are all skills that translate well into their future workplaces. Franklin Scholars is proud to have a partnership with Universify, a charity which provides students from non-selective state schools the opportunity to be a university student at the University of Oxford in a residential summer programme. We signpost pupils on our programme from areas of need to Universify, to encourage them to strive for, apply to and be accepted by highly selective universities. The programme has been shown to be successful in raising the GCSE attainment and the aspirations of students who attend. Looking forward, and empowered by the groundswell of support for the Gatsby Benchmarks, we will be doing more to help our participants successfully transition from education to employment. Over the coming years, we will expand and develop our programmes as we continue in our mission to raise the attainment and develop the skills of young people across the country. We will be doing this by strengthening our alumni programme, building links with businesses, and ensuring that Franklin Scholars (and Junior Scholars) are provided with tools that allow them to better access fulfilling and diverse careers.